Received August 1, 2017; Revised December 5, 2017; Accepted December 18, 2017.; Published online March 20, 2018. Low-grade pro-inflammatory state and leptin resistance are important underlying mechanisms that contribute to obesity-associated hypertension. We tested the hypothesis that Astragaloside IV (As IV), known to counteract obesity and hypertension, could prevent obesity-associated hypertension by inhibiting pro-inflammatory reaction and leptin resistance. 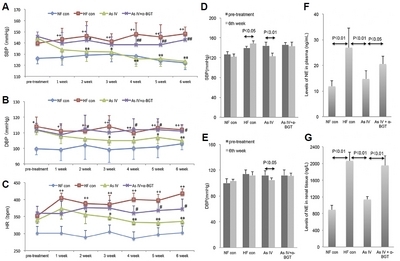 High-fat diet (HFD) induced obese rats were randomly assigned to three groups: the HFD control group (HF con group), As IV group, and the As IV + α-bungaratoxin (α-BGT) group (As IV+α-BGT group). As IV (20 mg·Kg?1·d?1) was administrated to rats for 6 weeks via daily oral gavage. Body weight and blood pressure were continuously measured, and NE levels in the plasma and renal cortex was evaluated to reflect the sympathetic activity. The expressions of leptin receptor (LepRb) mRNA, phosphorylated signal transducer and activator of transcription-3 (p-STAT3), phosphorylated phosphatidylinositol 3-kinase (p-PI3K), suppressor of cytokine signaling 3 (SOCS3) mRNA, and protein-tyrosine phosphatase 1B (PTP1B) mRNA, pro-opiomelanocortin (POMC) mRNA and neuropeptide Y (NPY) mRNA were measured by Western blot or qRT-PCR to evaluate the hypothalamic leptin sensitivity. Additionally, we measured the protein or mRNA levels of α7nAChR, inhibitor of nuclear factor κB kinase subunit β/ nuclear factor κB (IKKβ/NF-KB) and pro-inflammatory cytokines (IL-1β and TNF-α) in hypothalamus and adipose tissue to reflect the anti-inflammatory effects of As IV through upregulating expression of α7nAChR. We found that As IV prevented body weight gain and adipose accumulation, and also improved metabolic disorders in HFD rats. Furthermore, As IV decreased BP and HR, as well as NE levels in blood and renal tissue. In the hypothalamus, As IV alleviated leptin resistance as evidenced by the increased p-STAT3, LepRb mRNA and POMC mRNA, and decreased p-PI3K, SOCS3 mRNA, and PTP1B mRNA. The effects of As IV on leptin sensitivity were related in part to the up-regulated α7nAchR and suppressed IKKβ/NF-KB signaling and pro-inflammatory cytokines in the hypothalamus and adipose tissue, since co-administration of α7nAChR selective antagonist α-BGT could weaken the improved effect of As IV on central leptin resistance. Our study suggested that As IV could efficiently prevent obesity-associated hypertension through inhibiting inflammatory reaction and improving leptin resistance; furthermore, these effects of As IV was partly related to the increased α7nAchR expression. Fig. 1. 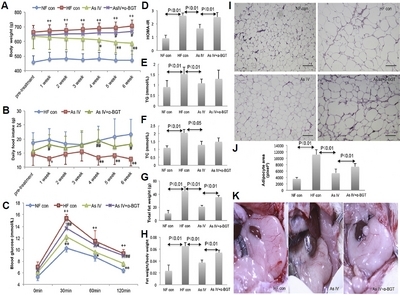 Chronic obesogenic condition resulted in activation of IKKβ/NF-kB pathway and production of pro-inflammatory cytokines in peripheral adipose tissue. These pro-inflammatory cytokines can feed back to the brain through passing through the blood-brain barrier, leading to hypothalamic IKKβ/NF-kB activation and chronic inflammatory reaction. 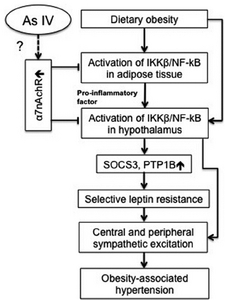 Chronic hypothalamic IKKβ/NF-kB activation resulted in selective leptin resistance by upregulating the production of SOCS3 and PTP1B, which cause sympathetic-mediated hypertension. In addition, hypothalamic IKKβ/NF-kB activation might directly cause sympathetic over-excitation. Accordingly, we hypothesized that As IV could prevent obesity-associated hypertension by inhibiting IKKβ/NF-kB-mediated inflammatory reaction and preventing leptin resistance, and these results of As IV is partly related to the up-regulated α7nAChR expression. Fig. 2. Compared with the HF con group and As IV+α-BGT group, As IV treatment (20 mg·Kg−1·d−1) (A) decreased body weight; (B) and daily average food intake in weeks 4–6; (C) improved glucose intolerance; (D) HOMA-IR; and (E, F) decreased levels of TG and TC (n = 5–7/group. In addition, As IV treatment reduced fat accumulation (G, K) in visceral tissue; and (H) decreased fat weight/ body weight in high-fat fed rats (n = 5–7/group). (I) As IV-treated rats possessed a smaller adipocyte size compared with the As IV group and As IV+α-BGT group (Scale bar, 100 μm). Data were presented as mean ± SEM. + p < 0.05, ++ p < 0.01 compared with NF con group; * p < 0.05, ** p < 0.01 compared with HF con group; # p < 0.05, ## p < 0.01 compared with the As IV group. Fig. 3. Compared with the HF con group and the As IV+α-BGT group, chronic administration of As IV significantly decreased (A, D) SBP, (B, E) DBP, and (C) HR during the 6-week observation period (n = 7/group); meanwhile, (F) the NE levels in the blood, and (G) and renal tissue also decreased (n = 5–7/group). Data were presented as mean ± SEM. + p < 0.05, ++ p <0.01 compared with the NF con group; * p < 0.05, ** p < 0.01 compared with HF con group; # p < 0.05, ## p <0.01 compared with the As IV group. Fig. 4. 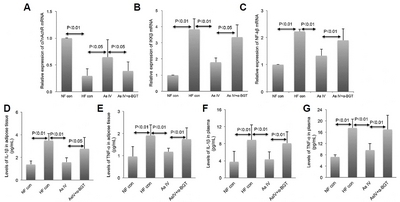 Chronic administration of As IV increased expression of (A, C) p-STAT3 and (E) LepRb mRNA; (D) decreased serum leptin level; and (B, C) hypothalamic expressions of p-PI3K; (F) SOCS3 mRNA; and (G) PTP1B mRNA in the high-fat fed rats (n = 5/group). Additionally, As IV treatment significantly increased the (H) mediobasal hypothalamic POMC mRNA expression compared with both the HF con group and the As IV+α-BGT group, and had no impact on the expression of (I) NPY mRNA (n = 5/group). Data were presented as mean ± SEM. Fig. 5. 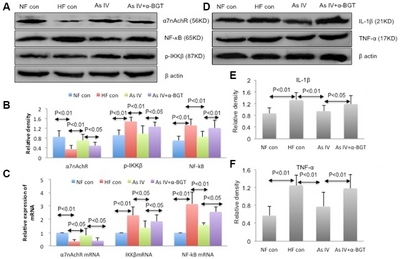 Compared with the HF con group and the As IV+α-BGT group, chronic As IV treatment up-regulated the (A–C) protein and mRNA expression of α7nAChR and reduced expressions of p-IKKβ and NF-kB, and decreased (D–F) contents of IL-1β and TNF-α in the mediobasal hypothalamic tissue (n = 5/group). Data were presented as mean ± SEM. Fig. 6. 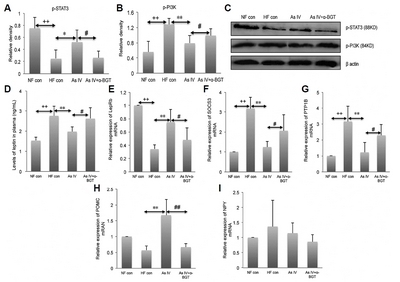 Compared with the HF con and As IV+α-BGT groups, As IV treatment up-regulated the (A) α7nAChR mRNA expression; and (B) suppressed mRNA expression of p-IKKβ and (C) NF-kB in adipose tissue of HFD rats, contributing to (D, F) decreased levels of IL-1β; and (E, G) TNF-α in blood and adipose tissue (n = 5/group). Data were presented as mean ± SEM.